Dr. Einat Wilf, chairman of the party’s caucus and who followed Barak after he quit the Labor party last year, told reporters, “We made it very clear we are running independently against all the rumors that we are joining the Likud, rumors that always were instigated by several paranoid members of the Likud. Lacking any other political home, Barak is gambling that his official entry in the campaign will attract more support to give him enough votes to pass the minimum two Knesset seats needed for a party to be represented in the legislature. All polls have showed him failing to reach the minimum, but a new poll Wednesday morning indicated he could win three seats. Elections are assumed to be called for early September or mid-October, but Prime Minister Binyamin Netanyahu will not announce his preference until the end of the seven-day mourning period for his father, Prof. Benzion Netanyahu. She described the new party as being in the political center and successor to the “hawkish wing” of the original Labor party. 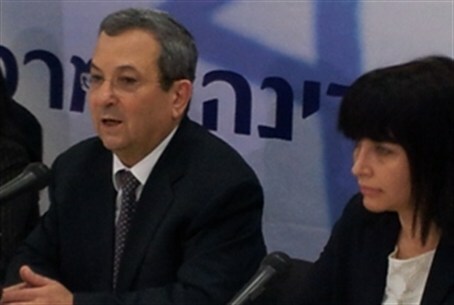 Barak made it clear in his remarks that he is running for Defense Minister. His success has been based on his connections with the military industrial complex, for which he worked after he quit politics following his being trounced in the elections in 2001. His voting base is in the metropolitan Tel Aviv area, which also is a center for support of the Kadima party and Yair Lapid’s new secular “Future” party.